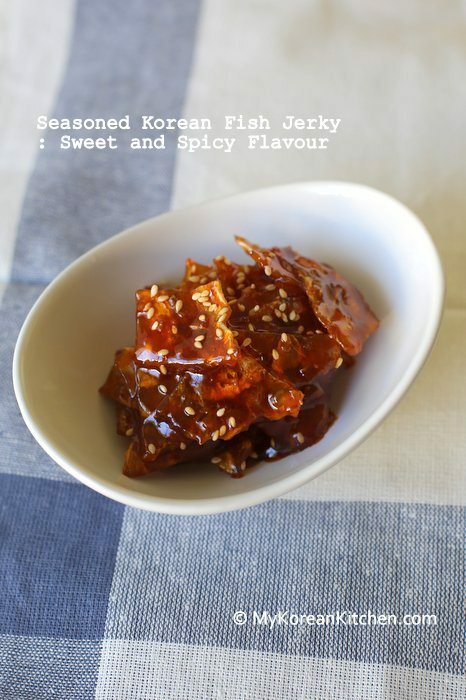 Delicious Korean side dish, seasoned Korean fish jerky (Jwipo Jorim) recipe! About 7-8 months ago I received a care package from my mum in Korea. It included some new clothing, loads of popular Korean cosmetic samples and there were several packs of seasoned dried filefish (Jwipo, 쥐포). Oh! This is out of blue I thought. Why on earth did my mum sent me these jwipo? By the look of it, it would have costed her at least US$100! Yes, it was a lot of them and they are quite expensive snacks nowadays! While I had enjoyed this delicious snack, I still had a lot to go through. 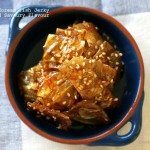 So I thought, why not make my favourite childhood side dish (banchan, 반찬) with it? The ingredients below list two different versions of Jwipo Jorim so you get to enjoy this twice as much. 😉 My preference is of course the ‘sweet and spicy’ version. I know this might be a bit strange dish to try out for some of you, but it really brightens your lunchbox. I hope you get to try it someday. P.S. 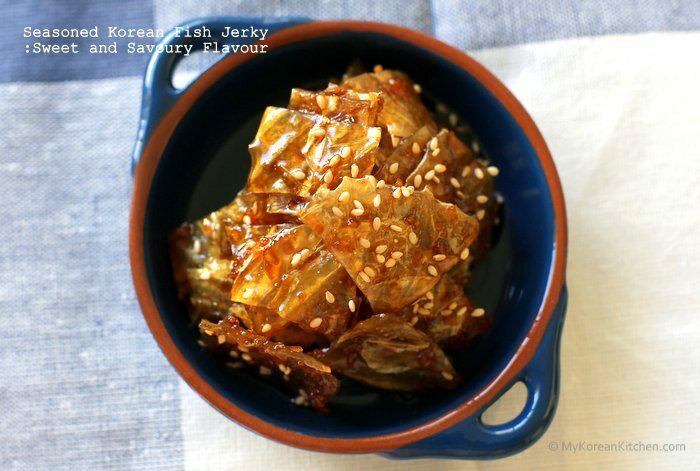 If you like this recipe, you might also like to try my spicy dried squid recipe. 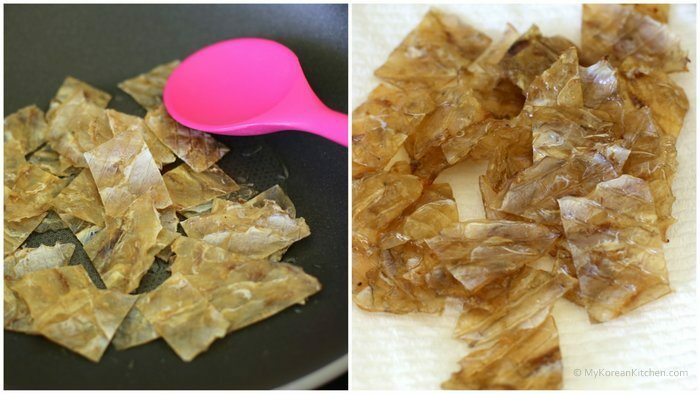 1.Cut the fish jerky into bite size pieces with a pair of scissors. 2. 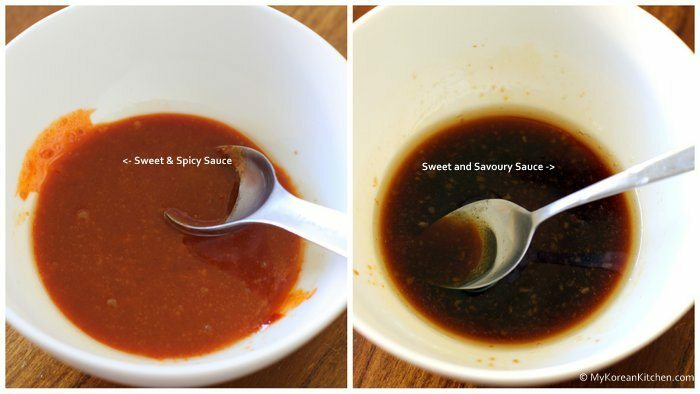 Combine all the seasoning sauce ingredients in a bowl and mix them well. 3. Place a wok on a stove and heat it up for a few seconds. Add the cooking oil and spread it. 4. Add the fish jerky into the wok and roast and stir it until it crisps, for 2-3 mins. 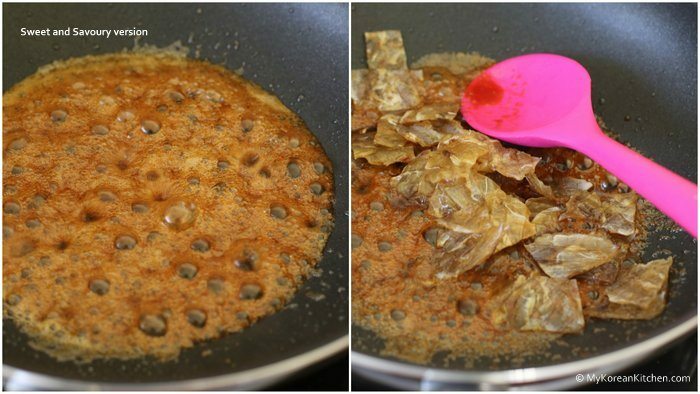 Once done, take the fish jerky out onto a plate of kitchen paper to absorb the excess oil. 5.Pour the seasoning sauce into the wok and simmer it for 1-2 mins. Add the fish jerky into the wok. Quickly mix them and remove the wok from the heat. 6.Serve it on a plate. Finish up by sprinkling some sesame seeds on top. 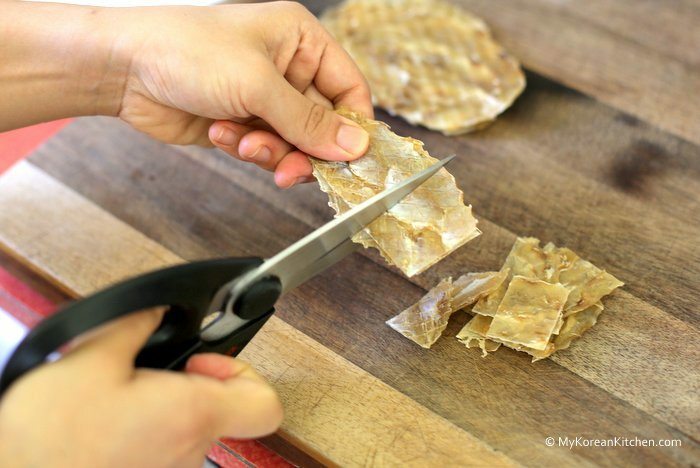 Cut the fish jerky into bite size pieces with a pair of scissors. Combine all the seasoning sauce ingredients in a bowl and mix them well. Place a wok on a stove and heat it up for a few seconds. Add the cooking oil and spread it. Add the fish jerky into the wok and roast and stir it until it crisps, for 2-3 mins. 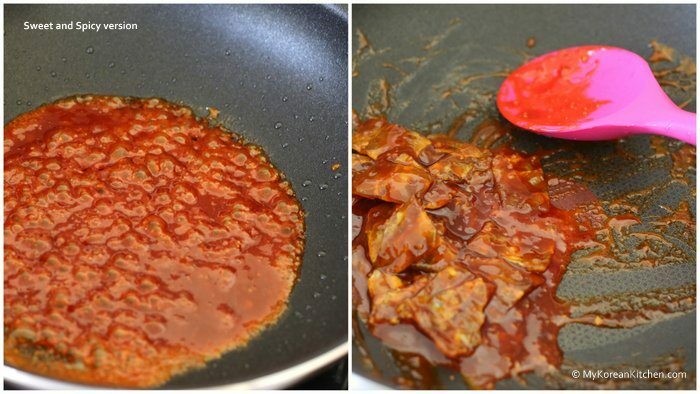 Once done, take the fish jerky out onto a plate of kitchen paper to absorb the excess oil. Pour the seasoning sauce into the wok and simmer it for 1-2 mins. Add the fish jerky into the wok. Quickly mix them and remove the wok from the heat. Serve it on a plate. Finish up by sprinkling some sesame seeds on top. I have never seen your blog before and I was doing some research on Korean foods. 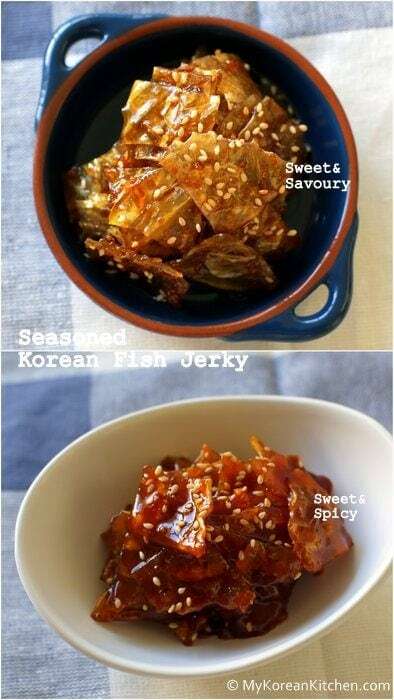 I make Korean Squid Jerky banchan all the time and then i found your fish jerky recipe and it looks amazing! I am totally going to add this recipe to my favorite banchans! Thanks for sharing! Hi Richard, Thanks for stopping by. I hope you enjoy my recipe. This is my all time favourite! You just reminded me how ridiculously large my box was too! I wish I have them more often. 🙂 Though EMS shipping is too costly to Australia from Korea. Anyway, I should try Singapore version of fish jerky too. It sounds interesting! Hi there! Just wanted to stop in to wish you a happy holiday (I know it is not until next week 🙂 ). Also, since this is holiday related, what is the significance of rice cake soup on New Year’s day and are there any other food related holiday customs that we may be unfamiliar with. I think you left your comment in a wrong post. The above recipe is not holiday related. The significance of rice cake soup is mentioned in the below post briefly. https://mykoreankitchen.com/korean-rice-cake-soup-tteokguk/ Also other holiday related food is listed below. 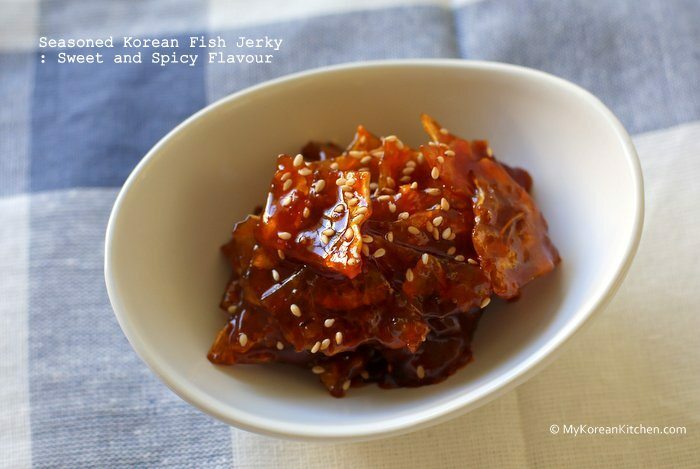 https://mykoreankitchen.com/korean-new-years-day-food/ Just note, there’s no Korean food relating to Christmas as it’s not traditional Korean holiday. I had wanted to wish you a happy holiday and then also, since my mind is on the pending holidays, inquire about the holiday traditions in Korea (specifically the soup). My wish for you was not related to your post but I did not know how/where to send my wishes so I just posted it under your blog post. I was not sure if you would be going away so I wanted to get it in prior to that LOL. Anyway, have a good one and I will read your link! Thanks Andra! I wish you a Merry Christmas and a great holiday. 🙂 Enjoy reading the links too. While they are a bit dated, you might get some basic idea. I’m planning to do an update post on the New Year’s Day food. 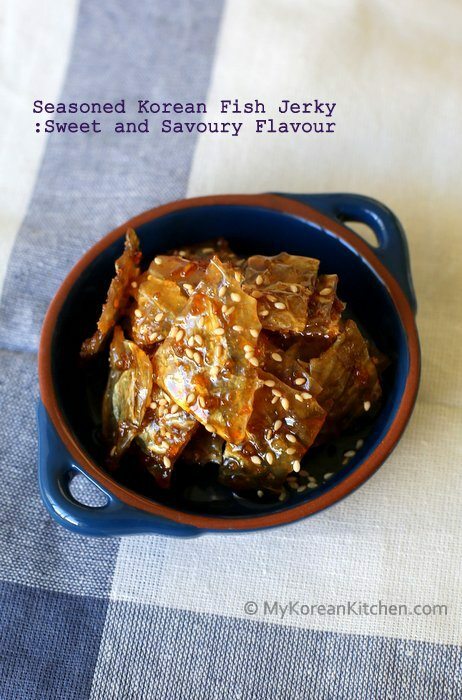 I am a huge fan of Chinese pork jerky (the one which is sweet and… hot of course!) and when I had a Chinese-American friend living here (she left alas…) she would bring me some regularly from a Chinatown shop in the US. Fish jerky sounds naturally like something I would go crazy for too. Especially in your sweet and hot seasoning. I hope I’ll find fish jerky one day and be able to taste it with your seasoning. I love 쥐포. It was my favorite 도시락 반찬 in my childhood. I prefer the sweet spicy version over soy sauce version as well. I haven’t had it for a while and I think it is about the time to make some for myself. Thanks, Sue! I honestly think I can eat this at every meal! 🙂 You’re welcome. I hope you enjoy it too! I will love this fish jerky! I actually prefer fish than meat when it comes to jerky (more familiar taste as I like Japanese version). This is a great savory snack! Absolutely! I love fish jerky too. They’re so moreish and they go very well with a beer. 🙂 Never tried meat jerky but I’m curious to find out.